The police today cane-charged residents, including women, of this village when they refused to stop the construction of a temple on disputed land in Shergarh Tapoo village. Suspended Congress MP Kuldeep Bishnoi seems to be on a sticky wicket, thanks to the growing factionalism amongst his supporters. A few days ago, former minister Subhash Batra was physically assaulted, allegedly by a son and supporters of a rival group within the fold. In an utter defiance of the directions of the apex court on banning the hoardings along the highways, “overexcited” Congressmen from Haryana have made driving on NH-1 riskier. Former Chief Minister Bhajan Lal today announced that if he returned to power, he would give 50 square yard plots to BPL families in HUDA sectors. Speaking to a gathering on the occasion of his birthday celebrations at his residence here, he said he would also exempt farmers from payment of certain revenue charges. He said he had not received any invitation for the “bijli rally” at Jhadli in Jhajjar district tomorrow and he had no plans to attend it even though Congress president Sonia Gandhi was scheduled to address it. Realising that food processing has an important role to play in linking Indian agriculture with consumers in the domestic and international markets, the Central government will set up the National Institute of Food Technology, Entrepreneurship and Management (NIFTEM) at Kundli in the district.Congress president Sonia Gandhi will lay the foundation stone of the institute tomorrow. Development works, or even a mere talk about these in political circles, have taken a backseat in the district as all concerned are apparently busy with the October 7 Jhajjar rally of the Congress to be addressed by Sonia Gandhi and the December 2 Rohtak rally being organised by Kuldip Bishnoi, suspended Congress MP from Bhiwani. The speaker of the assembly and MLA from the Beri constituency Raghuvir Kadiyan found himself in an awkward situation in Siwana village of the district yesterday evening when some villagers started raising slogans against him. The District Consumer Disputes Redressal Forum has found that the local Guru Nanak Khalsa College and Kurukshetra University had meted out a stepmotherly treatment to Amit Kumar of Fatehpur village here who had applied for admission to the college under a self-financing scheme in MPEd. Kiran Choudhry, Haryana minister of state for tourism and sports, today lashed out at the Haryana Cricket Association (HCA) for selecting Chandigarh as the venue for the fourth one-dayer between Indian and Australia. Fed up with the illegal sale of liquor, three panchyats of Sadhaura block have announced cash prizes to villagers who would help nab bootleggers. Engineers of the state PWD (B&R) today successfully installed a single-span bridge, weighing about 180 tonnes, near the Indian Oil Corporation (IOC) refinery near here. A newly-wed youth, Dayanand, of Pai village committed suicide by consuming sulphos after being allegedly beaten by his father-in-law at his in-laws’ house about four days back. The 11-member standing committee of Parliament on Railways during its visit to Gannaur railway station in Sonepat announced the extension of the Bhiwani-Panipat Ekta Express up to Chandigarh. A joint parliamentary committee today visited Waqf Board office in Ambala Cantt and took stock of the board’s properties. Rajya Sabha MP S.M. Lal led the committee and the other members were S.K. Kabiruddin Ahmed, Kamal Akhtar, Anwar Hussain, Narain Chandra Brokataki, Avinash Rai Khanna, Jaswant Singh Bishnoi and Mukim Mohammad. Vikas Parishad party activists today strongly condemned the registration of FIR against Vikas Parishad chief and former Ambala Cantt MLA Anil Vij in the tree-cutting incident. A meeting of Vikas Parishad activists was held on Saturday in which it was decided that a strong protest would be lodged against the police. Villagers alleged that the police even fired at them, a charge denied by cops. Around 10 persons, including policemen, were injured in the incident. The villagers, armed with lathis, blocked the road coming from the Dhigarh village side in protest against the police action. According to the villagers, 58 acres of shamlat land in the village is allegedly under the illegal occupation of four persons since 1994. These four are sarpanch of the village Omi Devi, Amir Singh Sirsma, Multan Singh and Lachman Singh. The villagers say Amir Singh is close to Chief Minister Bhupinder Singh Hooda. The village was earlier located on the disputed shamlat land, but due to the Yamuna changing its course, the entire village was shifted to the present location many years ago. Harpal Singh, who was leading the blockade, said on September 23, a panchayat was constituted which passed a resolution that the illegally occupied land should be returned to the village. “These four persons started abusing us. This angered the villagers and we forcibly occupied the land. On the same day, we tilled the land and started sowing seeds there,” said Harpal. “On September 26, the police arrested 12 persons and till September 28 they had arrested 22 more villagers,” he said. Harpal said on October 1, the villagers laid the foundation stone of a temple on the shamlat land and installed a hand pump. “Today, when the construction of the temple was on full swing, a police party raided the place and started beating up whoever came in their path. Even women were not spared,” he said. “In 2004, the high court also passed a judgment, saying that the shamlat land belonged to the village and it should be restored to them,” he claimed. He alleged that the police fired at them and two villagers, Prem and Santosh, suffered bullet wounds. 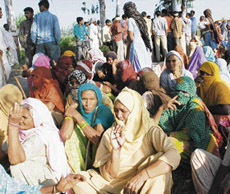 SDM R. K. Singh, who was present on the spot, denied that the police fired at the villagers or demolished the temple. “They were taking law into their own hands. Even if the other party had done wrong, the villagers have no right to take action on their own. Due process of law has to be followed, otherwise there would be chaos in society,” he said. “We just used tear gas against them and not a single shot was fired. The temple was also demolished by them to paint the police in poor light,” he said. In a bid to placate the humiliated leader, Bishnoi had made him the convenor of the proposed rally to be held here on December 2 and condemned the attack on him. He had also announced at a press conference that some concrete step would be taken against the persons behind the attack within two days. However, no such action has been taken till date. A number of Bishnoi supporters met him here last night and expressed their resentment against the stance adopted by him in this regard. These supporters, owing allegiance to the Krishan Murti Hooda group, crticised Bishnoi’s decision of making Batra the convenor of the rally and the purported move to sideline Hooda. They categorically stated that such a stance would sabotage the prospects of the proposed rally, as the rural residents would distance them from the camp. Apparently unprepared for the opposition, Bishnoi maintained that he held Krishan Murti Hooda in high esteem. He even alleged being misquoted by a section of the media, claiming that he had never said a word against Krishan Murti Hooda, who “is like an elder brother to me.” Bishnoi invited this section of his supporters for talks in Delhi and assured them that the matter would be settled amicably. From the given situation, maintaining a balance at this juncture seems to be difficult, especially in view of the nature of allegations being levelled by the supporters of both former ministers against each other. Moreover, though the urban voters are the mainstay of the Bhajan camp, they cannot afford to ignore the rural masses as well. How the father-son duo tackles the matter would be interesting to see. 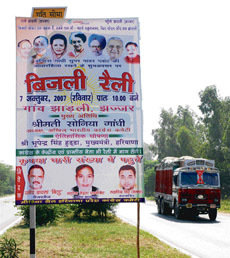 Scores of important signboards displaying the emergency helpline number and speed limits are covered illegally by the hoardings and posters of the ‘bijli rally’ to be held tomorrow at Jhajjar. A visit by The Tribune on the GT Road today revealed that the party workers had enormously used space along the NH-1 to display the rally hoardings, posters and banners displaying the photographs of Congress chief Sonia Gandhi, Chief Minister Bhupinder Singh Hooda, state party leaders Phool Chand Mullana and Kuldeep Sharma and cabinet ministers of the Centre and state. The most disturbing factor is that these hoardings and banners seem to have got the support from the state party leadership. The hoardings bear the photographs, names and their official positions in the state Congress party but the authorities have turned a blind eye to it. State police authorities have erected the signboards on the NH-1 showing the toll free accident helpline number-1033 and the speed limits instruction. But it was observed that scores of these signboards were not visible as they were completely covered by the rally posters and billboards. Terming it as a risky and unfortunate exercise, officials showed their inability in taking any action against their political bosses. Sonepat: The district administration has made elaborate arrangements for the free flow of vehicles and safety of the people, who will participate in the ‘bijli rally’ at Jhadli village in Jhajjar district on Sunday. As the vehicles coming from Panipat, Karnal, Kurukshetra, Yamunanagar, Ambala and Panchkula will pass through the district, different routes have been decided to insure jam-free movement of the vehicles. SSP Navdeep Singh Virk said besides appointing three deputy superintendents of police as observers on different routes, three gazetted officers, 21 non-gazetted officers and 91 other rank police personnel along with 13 traffic personnel had been put on duties to regulate the vehicular traffic during the day. Meanwhile, deputy commissioner DPS Nagal has appointed duty magistrates for law and order and security at the Kundli site where Congress president Sonia Gandhi will lay the foundation stone of the National Institute of Technology, Entrepreneurship and Management before going to Jhadli. Former Chief Minister Bhajan Lal today announced that if he returned to power, he would give 50 square yard plots to BPL families in HUDA sectors. Speaking to a gathering on the occasion of his birthday celebrations at his residence here, he said he would also exempt farmers from payment of certain revenue charges. He said he had not received any invitation for the “bijli rally” at Jhadli in Jhajjar district tomorrow and he had no plans to attend it even though Congress president Sonia Gandhi was scheduled to address it. Younger son and suspended Congress MP Kuldeep Bishnoi said the state was reeling under an acute shortage of power and water. Bhajan Lal’s elder son and Deputy Chief Minister Chander Mohan was conspicuous by his absence. Reports of supporters celebrating the birthday of Bhajan Lal were also received from Fatehabad, Yamunanagar, Bhiwani and Sonepat. The institute will be governed by the board of directors and will function like a company. The chairman of the board will be nominated by the Government of India. The board will be the executive body of the institute and will be responsible for academic, administrative and financial matters. The institute will be set up on 100 acres at an estimated cost of Rs 246 crore. The first academic session will commence from 2009 with 430 seats in different courses.The NIFTEM will be an apex information resource centre on aspects of food processing, an apex research and development institute in India in food and breweries and also an apex academic institution in the areas of food technology, entrepreneurship and management for the development, design, updation and standardisation of courses, training programmes, teaching methods and learning material. In order to achieve its mission, the institute will provide study and research facilities in Bachelor of Food and Technology, Master of Food Technology, Master of Business Administration, Master of Doctor of Philosophy, PhD, Master of Food Technology and Management and executive development programmes. Cornell University, USA, University of California, Davis USA, and Wageningen University of Netherlands have been identified for collaboration in different areas.A committee consisting of the representatives from the ministry of food processing, state government, engineers and architect from the Public Works Department and persons with experience in development of IT infrastructure will supervise the setting up of the institute. While the Haryana Congress has asked its state working president Kuldip Sharma to oversee the mobilisation programme in the district for the success of the Jhajjar rally, former minister of Haryana Subhash Batra held fort for Bishnoi for the past two days here to galvanise support for the Rohtak rally. President of the Faridabad (urban) unit of the Congress B.R. Ojha said the Jhajjar rally was evincing a good response from the public. According to him, the party leadership has assigned the task of mobilising 3,000 persons for the rally to each of the MLAs and an equal number to the party MP from Faridabad. However, the Congress circles here are stunned over the mayor, deputy mayor and three local councillors leaving for Kerala on an official trip. They will return after the rally. On the other hand, Subhash Batra, who has been made the convener of the December 2 rally by Bishnoi, came down heavily on the Congress, saying that the Congress rally was a mere eyewash to divert the attention of the masses who had great resentment against the government. The speaker had reportedly gone to the village to mobilise people for the “bijli rally” being held in Jharli village here. Some villagers were apparently unhappy with the district administration for its “failure” to address their complaints regarding scarcity of drinking water and other basic amenities despite repeated reminders. They vented their ire on the speaker when he went to the village. Women reportedly broke empty earthen pots to show their resentment regarding scarcity of water. As Kadiyan left the place, some villagers allegedly hurled stones on his vehicle and broke a windowpane. The forum has asked the college and the university to pay Rs 1 lakh as compensation to Amit. Amit had moved the forum, stating that he was not given admission though his name appeared on the merit list. Besides other competitions, he had participated in the 52nd Senior National Wrestling Championship organised by the Haryana Wrestling Association. Counsel for the college said he was not given admission because he had failed to produce the mandatory gradation certificate of his participation in sports from the state government. Counsel for the university said Amit was not given admission because he did not fulfil the eligibility criteria prescribed by the university. Counsel for Amit said Devi Dayal (yoga student) was admitted to the college in the MPEd course without being asked to fulfil the same conditions as demanded from Amit. The counsel said several other students who had been admitted did not fulfil the criteria. Regarding the admission of Devi Dayal, the counsel for the college said his case was sent to the university for verification and it was found that the case is pending before the high court. The president of the forum, in his order, said the admission of Devi Dayal was wrong and in violation of the university prospectus. The president said Amit was not eligible for admission, but the college gave another person (Devi Dayal) admission in violation of the rules and hence was entitled for Rs 1 lakh as relief. Choudhry, who had called reporters to her official residence to make an announcement about adventure tourism, got drawn to the issue of the cricket match at the very outset when a reporter jokingly asked her that was it to give free passes to the media for the match that she had called the press conference. The sports department of the state government was not in the picture, Choudhry said about the match and added that it should have been held in Haryana instead of Chandigarh, a union territory serving as the common capital of Punjab and Haryana. “It should have been in Faridabad or Lahli in Rohtak district”, she said. She said it was unfortunate that the HCA did not select either of the two Haryana stadiums for hosting the tie. “The state would have got revenue also from the match”, she said. Choudhry, who is having a running feud with HCA president Ranbir Singh Mahendra over the political legacy of the late Bansi Lal, besides having a property dispute with the cricket administrator elder brother of her late husband, said it was a great opportunity missed since it would take a while before Haryana was allotted another international match by the BCCI. Asked if the government should appoint an administrator for the HCA, like it did recently in the case of the Haryana Olympic Association (HOA), Choudhry said it could be done if affairs of the HCA were not found in order. She, however, added that she was not consulted by the government while appointing an administrator for the HOA. “It is in limbo now”, she said when asked about the tangle arising out of the existence of two parallel HOAs in the state. The panchayat of Bhogpur village yesterday announced a prize of Rs 100 for villagers who would catch liquor smugglers or sellers. The panchyat also ordered that anyone found selling liquor would have to pay a penalty of Rs 1,000. A resolution regarding the same was passed yesterday. Sarpanch Vinod Kumar said liquor was harming the youth. Labourers were also spending most of their earnings on liquor and their families were suffering. The new bridge has made way for the four-lane road being constructed to meet the demand of the upcoming Rs 25,000 crore mega project of naphtha cracker project in the area. Talking to The Tribune today, engineer-in-chief Mahesh Kumar said the bridge installed on the Delhi parallel branch canal was fabricated on the site. The 44-metre long and 8-metre high steel structure was pulled across the canal with the help of machines. The giant steel structure was placed on rollers and placed on the other bank of the fast-flowing canal. “The Delhi parallel branch supplies water to the national capital. With the use of the new technique, canal water was not stalled even for a minute,” he claimed. Earlier, a similar bridge was installed parallel to the new one, but that faced a major problem. The deceased’s father claimed that his son, who was married to Kavita of Nuna Majra in Jhajjar district on December 10, last year, had gone to bring his wife back from his in-laws’ house on Thursday. However, he was allegedly insulted and beaten by his father-in-law Mohan Lal. After returning, he reportedly consumed sulphos. They visited disputed Waqf properties in Nasirpur, Motor Market and Jagadhari Gate. They discussed the latest status of the dispute and sought solution to the problem. During the inspection of the properties, superintendent of police K.V. Ramana, additional DC Renu Phulia, SDM Mukesh Ahuja and other revenue officers were present. The committee members interacted with Waqf Board chairman Hamid Hussain and members Bashir Ahmed, Maulvi Mohammad Sayeed and Dr Parvez Ahmed. They had discussions about the properties of Waqf Board, recovery of lease money, status of educational institutions and other development-related matters. The committee members stressed upon a quick solution of the disputes and for better utilisation of the money received through the lease properties. They said the objective of the Waqf Board was the overall development and growth of the Muslim community and the board must meet its objective. A delegation of activists led by Som Chopra will submit a memorandum against the FIR with inspector general of police, Ambala range, S.S. Deswal on Monday. Anil Vij said the FIR is politically motivated. He said that they had sought registeration of case against the persons who had cut trees on September 25 but only a DDR entry was carried out and FIR was not registered.